A new discovery described by a team of international scientists, including Carnegie Museum of Natural History paleontologist Christopher Beard, suggests that anthropoids—the primate group that includes humans, apes, and monkeys—"colonized" Africa, rather than originally evolving in Africa as has been widely accepted. 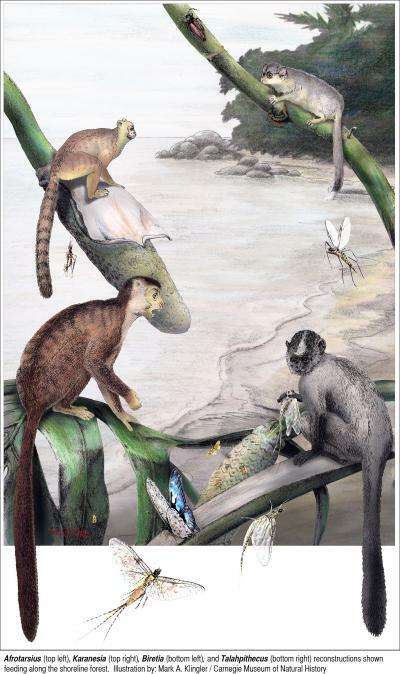 According to this paper, what is exceptional about these new fossils—discovered at the Dur At-Talah escarpment in central Libya—is the diversity of species present: the site includes three distinct families of anthropoid primates that lived in North Africa at approximately the same time. This suggests that anthropoids underwent diversification, through evolution, previous to the time of these newly discovered fossils, which date to 39 million years ago. The sudden appearance in the African fossil record of diverse anthropoid families can be answered in one of two ways, the paper's authors say. It could be the result of a striking gap in the African fossil record prior to this period. This is unlikely to be the case as Northern Africa's Eocene sites have been well sampled over the past century, and no diversity of anthropoid fossils has yet been discovered that predates the new Libyan specimens. Therefore, the paleontologists suggest, it is more likely that several anthropoid species "colonized" Africa from another continent 39 million years ago—the middle of the Eocene epoch. Since diversification would have occurred over extreme lengths of time, and likely leave fossil evidence, the new fossils combined with previous sampling in North Africa leads the paper's authors to surmise an Asian origin for anthropoids, as proposed by Beard and his colleagues in earlier work, rather than a gap in the fossil record. "If our ideas are correct, this early colonization of Africa by anthropoids was a truly pivotal event—one of the key points in our evolutionary history," says Christopher Beard, Curator of Vertebrate Paleontology at Carnegie Museum of Natural History and an author on the paper. "At the time, Africa was an island continent; when these anthropoids appeared, there was nothing on that island that could compete with them. It led to a period of flourishing evolutionary divergence amongst anthropoids, and one of those lineages resulted in humans. If our early anthropoid ancestors had not succeeded in migrating from Asia to Africa, we simply wouldn't exist." Beard has done extensive research on anthropoid origins, including his work on the primate Eosimias. His popular book, The Hunt for the Dawn Monkey, has been critical in positing Asia, not Africa, as the place of origin for anthropoids. The search for information regarding the origins of man's earliest anthropoid ancestors remains one of the most hotly pursued subjects in paleontology. "This extraordinary new fossil site in Libya shows us that in the middle Eocene, 39 million years ago, there was a surprising diversity of anthropoids living in Africa, whereas few if any anthropoids are known from Africa before this time," says Beard. "This sudden appearance of such diversity suggests that these anthropoids probably colonized Africa from somewhere else. Without earlier fossil evidence in Africa, we're currently looking to Asia as the place where these animals first evolved."